Alcohol addiction is a chronically relapsing disorder characterized by compulsive alcohol seeking and use. Alcohol craving and long-lasting vulnerability to relapse present a great challenge for the successful treatment of alcohol addiction. Therefore, relapse prevention has emerged as a critically important area of research, with the need for effective and valid animal models of relapse. 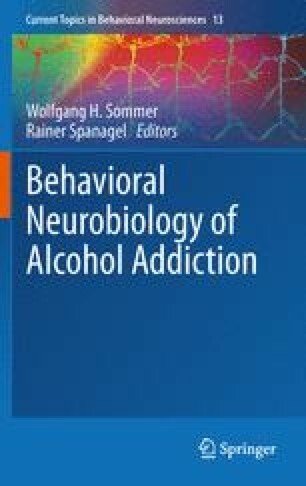 This chapter provides an overview of the repertoire of animal models of craving and relapse presently available and employed in alcoholism research. These models include conditioned reinstatement, stress-induced reinstatement, ethanol priming-induced reinstatement, conditioned place preference, Pavlovian spontaneous recovery, the alcohol deprivation effect, and seeking-taking chained schedules. Thus, a wide array of animal models is available that permit investigation of behaviors directed at obtaining access to alcohol, as well as neurobehavioral mechanisms and genetic factors that regulate these behaviors. These models also are instrumental for identifying pharmacological treatment targets and as tools for evaluating the efficacy of potential medications for the prevention of alcohol craving and relapse. Supported by grants AA10531, AA014351, and AA018010 from the National Institutes of Health/National Institute on Alcohol Abuse and Alcoholism to FW. The authors thank Michael Arends for editorial assistance.